RINGMAT PURE SIGNAL is a flexible cable of 4 conductors. Its low capacitance is maintained by advanced manufacturing techniques, with the screen helically wound over a polyester tape. This concept, together with how the cables are themselves configured between signal and ground, hot and cold, makes a very substantial screen for the whole interconnect without adversely affecting the signal and provides a very effective barrier against radio frequency interference. The cable jacket, whilst not moulded in the same way as for the Pure Power Cable, still gently holds the conductors in position, thus enabling the cores to adjust position as the cable is wound and handled, avoiding permanent twists and knots. As in the case of the Pure Power Cable, this arrangement helps reduce vibration internally and further enhances the sound. The cable is directional and normally this is in the same direction as the print on the cable. There are indicators on the made-up cables showing the direction in which the signal should flow through the cables and the direction is also made clear in other instances. Initially, all interconnects were offered terminated with Ringmat RCA phono plugs adapted and modified from those used with the DNM/Reson cables. Until the new WBT Nextgen RCA type phono plugs subsequently became available, the Ringmat RCA type plugs were by far the best we had encountered during exhaustive listening tests over a long period of time. The nextgen WBT phono plugs are currently the best RCA type connectors for the Pure Signal cable. Accordingly, they are now available with all our Pure Signal Premium cable products. They are, however, more expensive than our Ringmat RCA phono plugs. Also, for certain applications, such as where the centre hole of certain RCA type phono sockets are too small for the WBT Nextgen plugs centre pin, the Ringmat plugs are the ones to use. Other plugs and types of connector, such as the Black Neutrik XLR plugs and the Puresonic 6055 BNC connectors, are also now available. 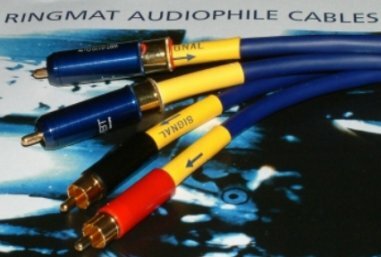 Information about these connectors is detailed under Ringmat Balanced Analogue Cables and Ringmat Premium Blue Tonearm Cable with BNC connectors.